Root canals may be needed to save a tooth that is infected, or to keep a tooth from being hyper sensitive as a result of a deep cavity or if extensive drilling on the tooth is needed when placing on a crown. The nerve and blood supply have to be completely removed, and the condits filled with a material called gutapercha. With the root canal, the roots are numbed to allow the dentist to get rid of the affected nerve, remove any infection, and save the tooth. 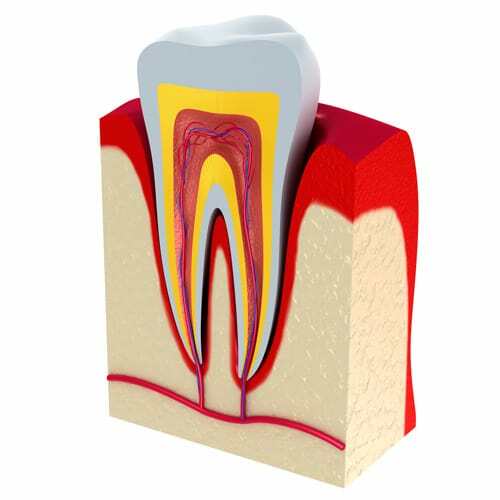 If a tooth is not infected, the root canal can be completed in just one visit. However, if there is an active infection, the root canal, is usually completed in two visits. This is because it is necessary that all active infection be completely removed, and the bacteria dealt with before the tooth can be sealed up First the pulp and infected nerve tissue is removed, and the tooth conduits are medicated with an antibiotic. The patient is also given a prescription of oral antibiotics for a week. After the medication has done its work, the patient needs to return so the root canal can be finished, and a post and crown made.